This Unit Has Been Working Since Last 4 Years In Different Leading Medical Colleges And Medicals To Help The Poor And Ignorant Helpless Patients For Their Treatment And Early Recovery. This Unit Has Gone A Long Way Away In The Bygone Days For Their Admission, Surgery, Blood Infusion, In Addition To The Free Medicine Supply Arranged By The Organization From Different Sources. For The Sincerity And The Devotion Of The Unit The Medical Service Has Been Geared Up To The Maximum For The Betterment Of The Poor Patients. The Volunteers Maintain The Vigil Round The Clock For Such Herculean Task. Presently We Are Working In 5 Premier Medical Colleges Of Orissa. The Main Objective Of The Project Is To Provide Various Services To The People Coming From Different Parts Of The State Of Orissa To The Premier Medical College Hospitals Situated At Berhampur, Burla And Cuttack And Facing Different Problems In The Hospitals To Co-ordinate Between The Doctors, Staff Of The Hospitals, Nursing Homes And The Patients, To Give Guidance About Different Wards, Doctors And Staff Of The Hospitals, Medicine Shops, To Provide Accommodation And Fooding To The Patients/attendants Of The Patients, Donate Blood And Provide Medicines Wherever Necessary. It Also Helps The People To Purchase Medicines At Proper Price At Their Own Cost From Different Medicines Shops. The Project Work Is Going On In The Following Places. 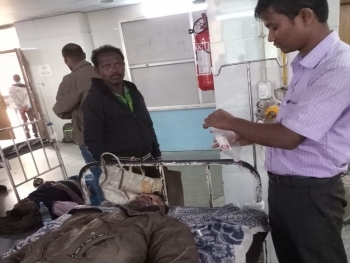 Two Co-ordinators (Netranjan Rath - 8895745853, Santosh Kumar Mandal -9668350680 ) Are engaged For The Proper Coordinating The center And One Office Is Functioning To Provide Necessary Accommodation To The Patients As Well As Their Attendants. Different Services Are Provided By The Volunteers Of UBSS To The Patients Coming From Remote Places Of Odisha. Several health Camps Are Also Being Organized In The Slum Areas. Necessary Assistance is Being Provided To The Patients Like Consultation Of The Doctors, Provide Blood From The Volunteers, Medicines And Other Pathalogical Investigation At Concessional Rate. We Maintain A Data Base Of The Patients And Invite Them To Attend The Annual Function Of The Samiti..
Two Co-ordinators (Rudranarayan Mohapatra - 9437521433, Saroj Kumar Pradhan - 9439290374) Are Coordinating The center And All Govt. As Well As Corporate Hospitals In Bhubaneswar. 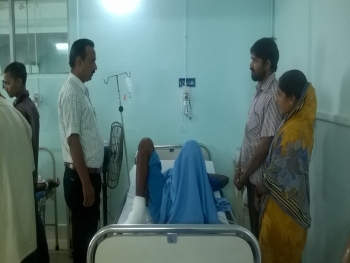 One Office Is Functioning To Provide Necessary Accommodation To The Patients As Well As Their Attendants. Different Services Are Provided By The Volunteers Of UBSS To the Patients Coming From Remote Places Of Odisha. Several health Camps And Blood Donation Camps Are Also Being Organized. Necessary Assistance is Being Provided To The Patients Like Consultation Of The Doctors, Provide Blood From The Volunteers, Medicines And Other Pathalogical Investigation At Concessional Rate. We Maintain A Data Base Of The Patients And Invite Them To Attend The Annual Function Of The Samiti..
III) SHUSHRUTA SWASTHYA SAHAYATA KENDRA (SSSK)- SV NIRTAR, OLATPUR. The Samiti Has A small Accomodation With Six Nos. Of Rooms For The Patients As Well As The Attendants. (Lokanath Behera -7504546999) co-ordinates The seva Works In Olatpur. We Provide The Different Seva Indicated Above. Sri Rudranarayan Mohapatra Is In Over All Charge Of The Different Seva Of The State As Well As Bhubaneswar. 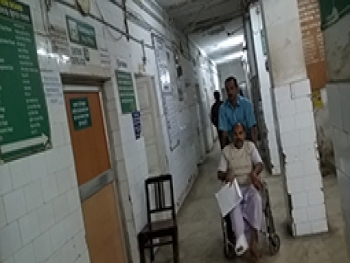 THOUGH MUCH MORE ACCOMODATION AND OTHER FACILITIES ARE EXPECTED BY THE PATIENTS, THE SAMITI IS UNABLE TO KEEP UP THE DEMAND OF THE PATIENTS DUE TO PAUCITY OF FUNDS. WE EXPECT PHILANTHROPIC PEOPLE AS WELL AS CORPORATE HOUSES TO HELP IN THIS REGARD. 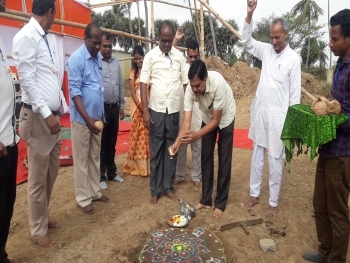 26.02.2019 At 9AM The Foundation Stone Was Laid For Four Storied Building For The Patients Of SVNIRTAR And Their Attendants By Sri V Vageya Ji, Saha Sarakarybaha ( Jt General Secretary) RSS , Sri Dharmedra Pradhan, Hon'ble Minister, PNG And Kaushal Vikash, Govt Of India And Sri Singh, Director, ONGC At Olatapur,Cuttack For In The Morning With Financial Support From The CSR Initiatives Of ONGC. At The Out Set Sri Vhageya Ji Narrated How The UBSS And RSS Has Come Forward To Assist The People In Distress After 1999 Super Cyclone Of Jagatsingpur, Phyline Of Ganjam And TITILI Of Gajapati By Providing Them Food, Shelters, Clothes And Other Necessary Articles. The Hon'ble Minister Described How The Different Projects Are Being Funded By The OIL Firms From Their CSR Initiatives. 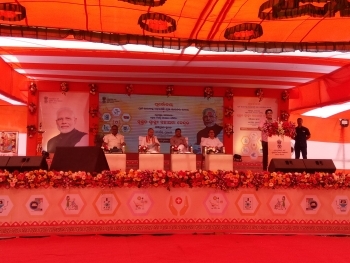 Sri Singh, Director Described How The ONGC Has Taken Up Different Development Projects From The CSR Initiatives Throughout The Country And The Cost Of The Present Project At Olatapur For The Patients Is About 2.32 Crores. 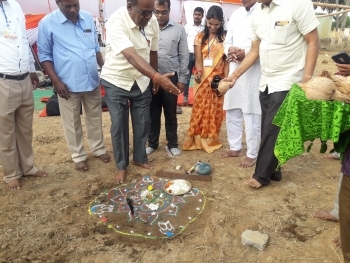 In The Afternoon On 26/02/2019 The Tribal Hostel Project Was Inaugurated By Sri V Vhageta Ji, Saha Sarakarybaha, RSS ( Jt Geheral Secretary) Alongwith Sri Dharmedra Pradhan, Hon'ble Minister, PNG And Kaushal Vikash, Govt Of India. The Tribal Hostel Is Meant For The Computers Training Of The Tribal People Who Will Given All Facilities To Become A Computer Trained In Free Of Cost. The Members Of UBSS Alongwith Several Philanthropic People Have Come Forward To Help The Students.